This is unlike Portable Class Libraries where a single assembly is compiled and shared between the projects that use it. Files in the “Shared” project are included and compiled directly alongside the platform-specific projects’ own files. XAML resources are a bit different. 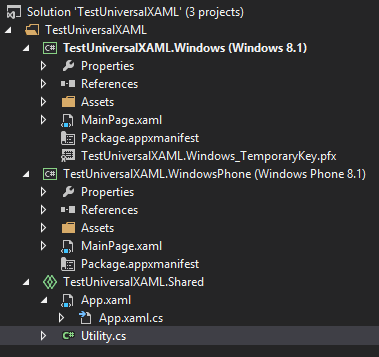 It isn’t currently possible to have conditional XAML within a single file (although there is at least one effort being made toward that goal), so you either have to share the entire file or make a separate copy for each platform. 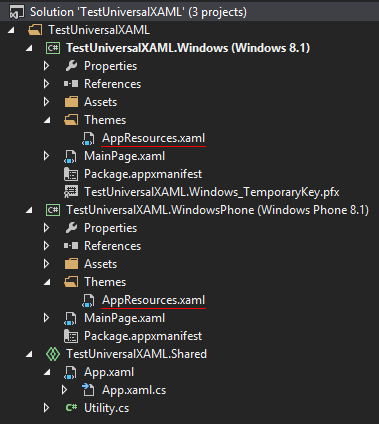 If you want to define app-wide XAML resources (outside of the context of a particular page or control) you might typically do that in App.xaml. 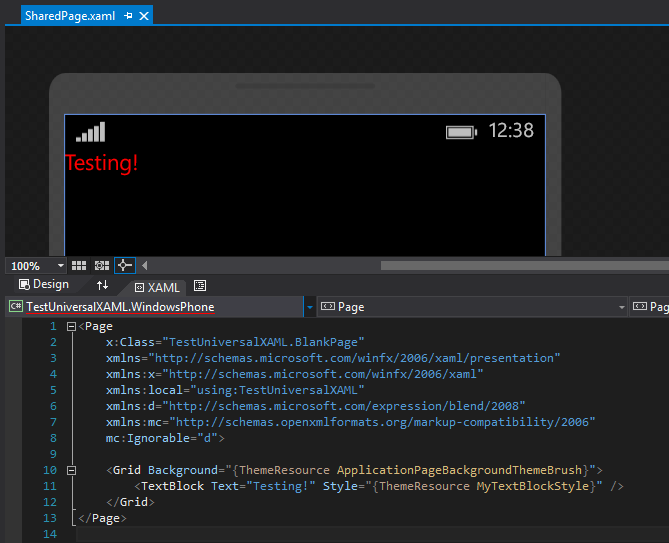 But if you share App.xaml/App.xaml.cs between both the phone and desktop platforms (and you should!) then it becomes impossible to have different app-wide XAML resources on each platform. From there, just put any XAML resources you need in the platform-specific AppResources.xaml file and they will become available throughout your application. 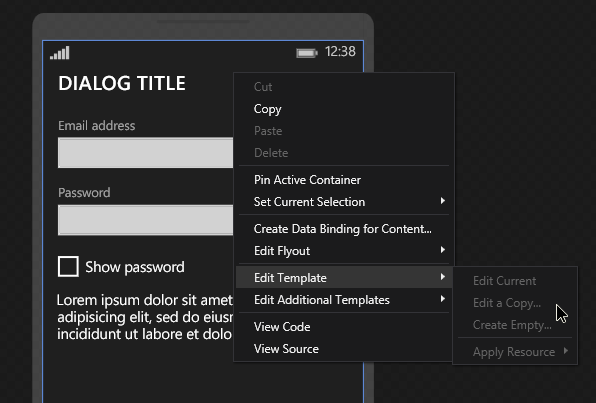 Any styles or other resources will work in the Visual Studio designer window and the new XAML static resource autocompletion will continue to work exactly as you’d expect. This also makes it easier to share pages and user controls between platforms. You can reference platform-specific styles, DataTemplates, or any other static resource from shared pages/controls as long as a resource exists with the same name on each platform. In most situations, this will probably be a better solution than modifying control properties from conditional code in the code behind. 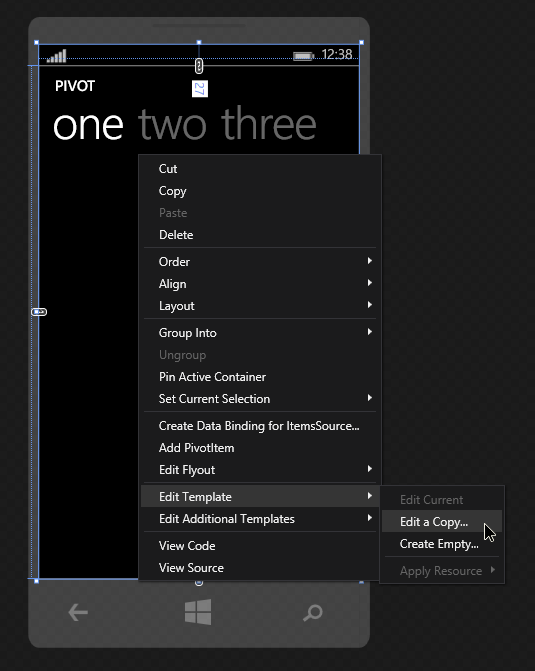 Not only does it help maintain the separation of code and layout, but it also works perfectly within the Visual Studio designer. Clicking “Edit a Copy…” will allow you to name the new style and select where you want to put it. 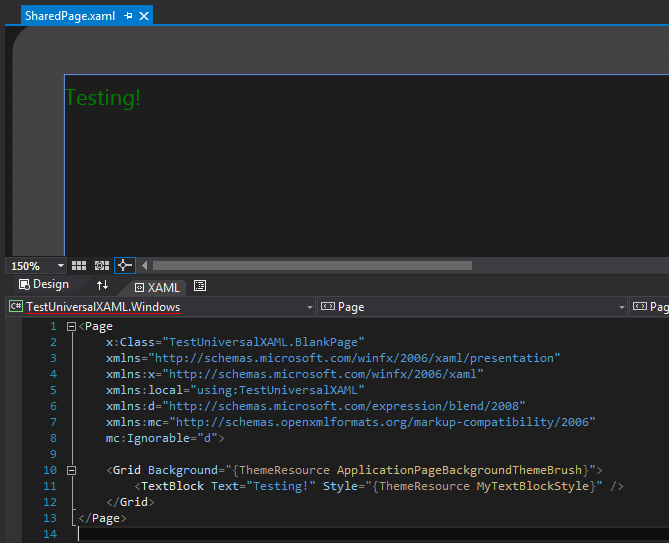 Visual Studio will copy over the default properties and point your control to use the new style. From there, you can copy the styles and templates you need into your app and modify them as necessary. Update October 14, 2011: If you are using Buttons in your item templates this may cause some issues. See the comments at the bottom of the page for more information and a potential workaround. A few days ago I tweeted about a ListBox scrolling issue I found with WP7 Mango when using item templates that have different heights. I first noticed this issue when using the Silverlight Toolkit’s LongListSelector control, but I found that it also applies to the standard ListBox control (which the Mango version of the Silverlight Toolkit uses internally to display data) whenever list items have different heights (e.g., wrapped text, list headers/footers, etc.). In short, the issue is that after tapping/selecting an item in the list, scrolling becomes extremely jumpy. It’s a bit hard to describe — it’s not just a matter of poor performance, the list scroll position will actually jump up or down as you try to scroll through the list. I found a relevant bug report on the SL Toolkit’s issue tracker here. At first I thought the issue was caused by selecting an item within the ListBox but I found that deselecting the item didn’t fix the scrolling behavior. After doing some further testing I discovered that the issue was triggered whenever the ListBox (or a control displayed within the ListBox) gained focus. Setting focus to another control on the page seems to fix the issue completely. I’ve seen a few posts on Twitter and this blog post by Jeff Wilcox about the issues with using a remote image on secondary live tiles, so I thought it might be useful to share the workaround I developed for a new WP7 application I have been working on that makes heavy use of secondary tiles. When creating a secondary Tile, the BackgroundImage and the BackBackgroundImage images must be created using a local resource. Update Feb. 26, 2011: Crash logger code has been modified to provide more details, including the OS version, current culture, current XAML page, and whether the app is obscured or locked. Recently I found Andy Pennell’s LittleWatson Class, which is designed to log and report any unexpected crashes in your WP7 app. This can provide extremely useful data about problems your users have experienced and, if you tend to run your app without debugging enabled, crashes that occur during development. Andy’s code is designed to send error reports via e-mail, but I’d prefer something a bit less intrusive. For Remote, I decided to write a class similar to LittleWatson that would submit the error reports to a script running on my web server. When I first started developing Remote, Microsoft had not yet provided a way for developers to see how many downloads their apps were getting. Microsoft now provides app download statistics via the App Hub, but the data is delayed by 6 days and only shows new installations – app upgrade statistics are not available. With this in mind, I decided to create a simple installation tracking system to monitor how well my app was doing in real time. Looking through the App Hub Forums, I found a few other sales tracking systems. This one, based on Google AppEngine, tracks not only installations but usage activity and phone model and manufacturer information. This one is based on the Silverlight Analytics framework and uses Google Analytics for reporting. My tracking code is much simpler and does not require any third-party frameworks, but it only reports new installations and upgrades. If you need to track feature usage information, you might be better off using one of the other solutions rather than trying to modify this code to your needs. Also, it’s worth noting that retrieving device manufacturer and model information requires an additional capability listing (“phone identity”) which may deter customers from wanting to try your app.